We have had another great two weeks at Hillside since our last Newsletter was issued. It was also wonderful to see so many K2 Hillside parents at the ESF Year 1 Admissions information session held at ESF Centre last Wednesday evening. Both Audrey and I appreciated the opportunity to talk to many of you at this event and look forward to seeing many of you at our K2 Teacher meet and great information session that will commence at 4pm next Monday 3 September 2018. Can we please remind parents and caregivers that drive their children to and from Hillside to please be aware of where you are parking and to not park in the grounds of Bradbury School or in front of the Exit gates of either Bradbury School or Hillside Kindergarten. Please do not leave your car parked on Stubbs Road for extended periods when dropping off your child as we all know there are very limited parking places. Parking is always going to problematic given our location on Stubbs Road and we thank you in advance for your cooperation with this request. Please remember if a change needs to be facilitated to your child’s going home routines such as being collected as a walker instead of going on the bus home please do write a note in your child’s diary or call us on 2540-0066 (NOT EMAIL) to inform us of this arrangement. Please also inform the bus company to ensure the bus mother of your child’s bus will be informed. If your child is enrolled with the bus company, we will assume your children will be riding the school bus everyday UNLESS you inform us otherwise. It is very important for you to inform us as soon as possible, for any changes to normal going home routines. On this note, please be reminded to always have your pick-up cards with you when you collect your child at school or off the school bus for safety reasons. The deadline to lodge an application for an ESF Year 1 place is the 30 September 2018. Don’t forget to send all supporting documents requested to ESF Centre by 7 October 2018. Please CLICK HERE to access the Y1 Admissions Talk Presentation. Please note you will be required to submit a “copy of one of your child’s kindergarten reports.” If you didn’t save it last year, you can still login to Gateway to print or save it as a PDF under the ARR section. The ESF K1 application period for the 2019-20 academic year is from 1 – 30 September. To apply you will need to complete the online application via the ESF Kindergarten website. 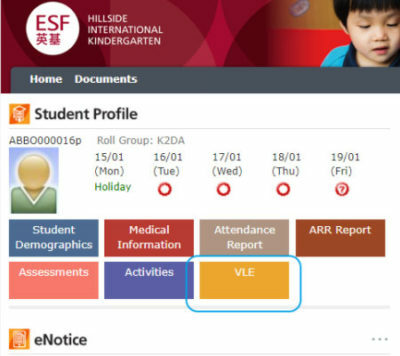 As a place at Hillside is in such high demand, please make sure you APPLY ON-TIME on http://www.esf.edu.hk/kindergartens-application-form/. Late applications are always processed after the on-time applications – and this is also the case for late sibling applications. Please also remind your friends (who may be seeking a K1 place for their child in the 2019/20 academic year) about this important application process. Don’t forget to send all supporting documents to ESF International Kindergarten Hillside by 7 October 2018. On this note, we will be conducting our play visit/interviews for our 2019/20 K1 intake in January 2019. Please note that this will be a school closure day for current Hillside students. The reason for having a school closure day is to enable us to conduct the majority of our K1 play visits / interviews on one day, rather than spreading them over a three-week period as this causes major disruptions to regular classroom programs (as teachers need to be constantly released from teaching duties to conduct the play visits/interviews). We would like to introduce our new families to the “Hillside Learning Hub” (https://hshub.hillside.edu.hk). We hope this will be a more convenient way, for parents and teachers, to share the children’s learning journey. Parents can also access all general school information, such as the school calendar, uniform order forms, admission and fees information. Please keep in mind that parents will still have to access ESF Gateway for student reports, updating student demographics, and eNotices. We will be using this platform for gathering individual evidence of your child’s progress in the form of an ePortfolio and this will be shared with you privately, in a similar way to our existing reporting system on ESF Gateway. This will replace the traditional hard-copy portfolios. We will be sending home any hard copies of the children’s work on the day, so it’s more relevant for young children when parents talk to them about their work. We will also use this new platform as a way of sharing our whole class learning (class blogs) and parent communication, including the sharing of policies and procedure, parent resources and parent volunteering. You can sign-up for parent volunteer by clicking on the green “V” icon to access the sign-up forms. The sign-up forms are not open until late September. You can access this platform via ESF Gateway. Please contact us on kinder@hillside.edu.hk if you any difficulties accessing the websites. We cordially invite those K2 parents who would like to meet their child’s teacher to come along to Hillside on Monday, 3 September to say hello and see their child’s classroom from 4.00-5.00pm. Please note: This “meet and greet” session is intended to serve as an informal opportunity for parents to meet your child’s new teacher and see their new classroom. It is not intended to be a time to discuss your child’s progress formally. You are not required make an appointment. On Thursday, 6 September, (9:00 – 10:00am or 12.45 – 1.45pm), we will be talking about the Primary Years Program (PYP). This is an opportunity for you to learn more about the curriculum and our PYP Program of Inquiry. To attend the sessions, please call the Hillside office to reserve your place, but note that once a session reaches “capacity”, you may be asked if you can come on another day. The slides for both recent parent presentations will be uploaded to the Hillside website for parents that are unable to attend these sessions. Our K1 and K2 teachers will each share different learning opportunities with parents and explain the learning intention behind each one (with the aim of enabling parents to reinforce and extend their child’s learning at home). We hope that this parent workshop will provide parents in attendance with a bank of ideas and activities to do with their child at home. Please click HERE for last week’s Home-School Partnership Presentation.